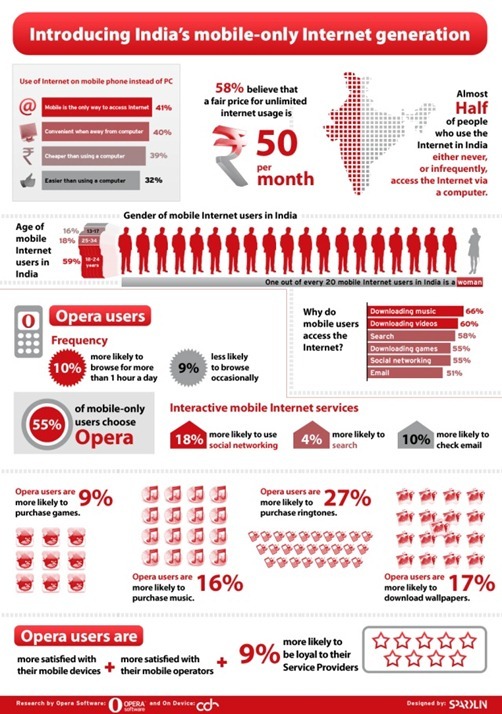 Opera, the makers of popular Mobile browser, Opera Mini, have released an infographic which offers quite an interesting insight on “Mobile only” generation. Did you know that 49% of all Indians who access internet, either never or only infrequently use computers – Mobile is their first or only choice to access to Internet! This is a shame – Only one out of every 20 mobile internet user in India is a Female! Close to 60% of the Indian Mobile Internet users fall in 18-24 yrs age bracket! It’s also pretty inaccurate as far as I can see – according to Google and Internet World Stats, the total Indian Internet user population is about 100m, so whichever way you slice it, there’s nowhere near 49% of them who are mobile-only. Estimates I’ve seen suggest there’s about 25m mobile Internet users in India, and from the description above it suggests that 49% of those are mobile-only, with the remainder using both mobile and PCs. So the best estimate would be that around 12.5% of Indian Internet users are mobile-only (or “mobile-mostly”), 12.5% are mobile+fixed and 75% are fixed-only. Yeah Ghosh, you are right – It is basically a typo in the Title..Will update it . I obviously meant – Half of Indian Internet users ! Internet is very huge media used via web platform and todays world is most fascinated by internet.